Once we had reached the border between the forest and the wet boggy Muskeg Plateau on the hill above Petersburg, the walking was much easier, the steps were not so steep and we had a different lot of plants to look for and photograph. The first one was obvious. All the way along the side of the path were the fluffy white seed heads of cotton plants, Eriophorum. David and I have seen various cotton grass species in many wet boggy areas in Europe, especially in the peat bogs of Ireland. 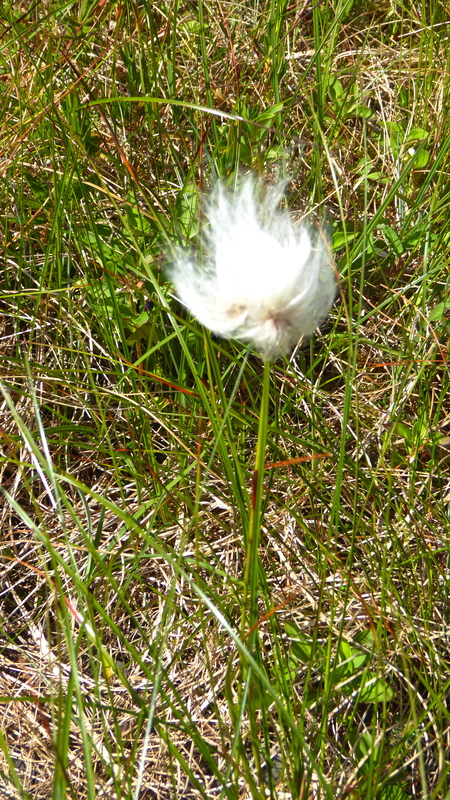 Eriophorum chamissonis, is one of the two cotton grasses common in the muskegs of this part of Alaska. This species has a solitary spikelet at the tip of a rounded slender stem. The plant grows from spreading rhizomes, so if conditions are right, they can spread rather quickly. In fact, cotton grass is so extensive on these muskegs that, in a good year, the whole plateau can look white like snow because of the fluffy heads. 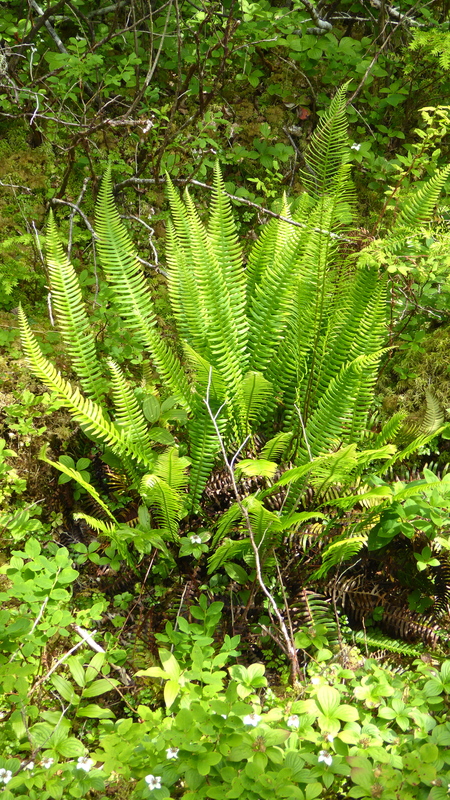 One of the plants growing just at the border between forest and bog was this upright fern commonly called Deer Fern; Blechnum spicant. I’ve read that some indiginous peoples used to chew the very young leaves as hunger suppressants! Others used the leaves to treat skin sores. Apparently, the people had noticed that the deer, who love to eat this plant, would rub their antlers on the leaves after their antlers had fallen off. The problem for us as plant photographers here in the muskeg was that plants were often just tantalisingly out of reach; we couldn’t step off the boardwalk onto the grass to take photos as it was very, very wet; and, in any case, our footsteps would harm the environment. Of course, the native animals didn’t use the boardwalk, as these moose footsteps show… at least we were told that they belonged to a moose. That’s all we saw of any moose. A single file line up of walkers is not the easiest place to give a talk about muskeg bogs. 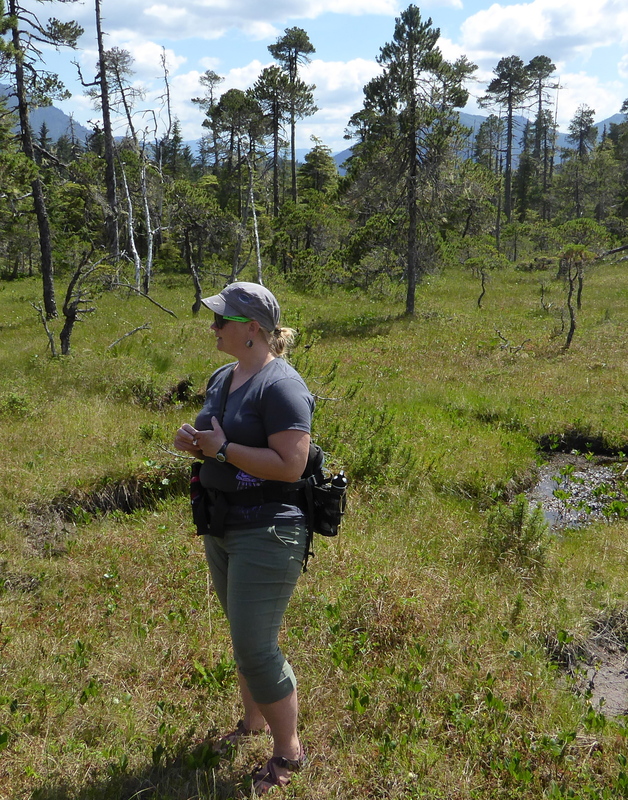 However, our very knowledgeable and delightful naturalist, Caroline Jezierski, solved the problem… she found a dryish patch off the boardwalk so that she could talk to us all about this very different environment. So what is muskeg? The name is used in Western Canada and Alaska to describe peat bog that is formed, often over millennia, by an accumulation of slowly decaying matter in undrained or poorly drained land. Because of the wetness and lack of phosphates and nitrates in the soil, trees are scattered and generally stunted. The land behind Caroline clearly shows the line where the muskeg, on the plateau, meets the forest, on the downward slope of the hill. It’s all about drainage and decomposition. 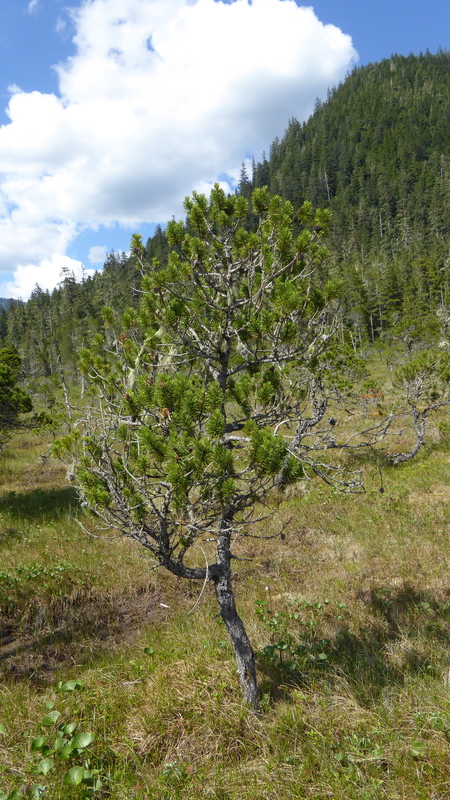 Muskeg forms in areas that have abundant rain, cool summers and very poor drainage. It’s permanently waterlogged with stagnant pools. The soil is acidic and relatively infertile, preventing the growth of the large trees to 33 m (100 ft) such as those we’d seen growing further down on the slope where drainage is more normal. Down there, in the forest that we’d just walked through, the soil is drier and, when a plant dies there, it is attacked by bacteria and fungi and rots away relatively quickly. But here in this bog, dead plants decompose differently. Cool temperatures and less oxygen in water-logged soils combine to cause bacterial and fungal growth to markedly slow down and so the whole process of decomposition is much slower; so slow that, over time, as plant debris gradually accumulates, it forms peat and eventually becomes a muskeg environment of specialised bog loving plants. It was hard to believe the notion of cool summers as the sun beat down on us that hot afternoon. But this was a dry summer; many of the bog pools were drying out and conditions were too warm and dry for a normal month of June. 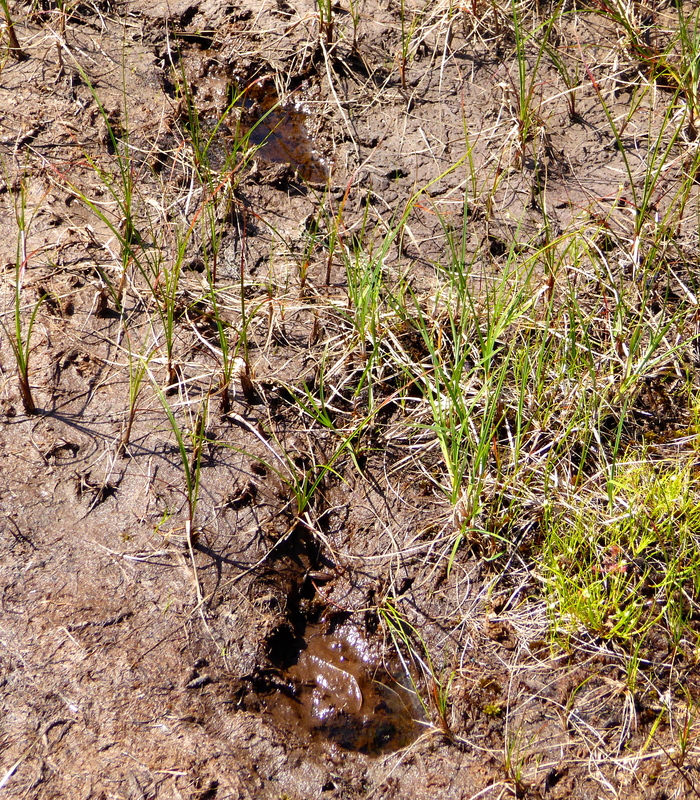 The roots of these bog plants would soon dry out if normal conditions didn’t soon return. The balance of nature is very much effected by changes in climate and June had been the driest month on record for the area. This ‘pool’ was already too dry to support any of the usual bog plants. but they are not good for muskeg plants. At this point in our walk, there was a small rest platform for which a number of us were very thankful. I was also grateful to the family of “Jake” who had placed a wooden seat on this platform. I took the opportunity to rest for a few minutes and take in the scenery. The main group continued with the walk across the plateau towards the higher slope where the forest began again. Someone thought they could see an eagle’s nest. With fewer people on the board walk, David took the chance to get some photos of the plants that he found growing in these boggy conditions. Good plant photography can’t be rushed and, with most bog plants growing so low to the ground, you really do need a bit of space to kneel. David’s results were well worth the effort as we shall see. The well named Arctic Cotton, or Cotton Grass, Eriophorum angustifolium is the other local species of Cotton grass plant on the muskeg. It, too, enjoys wet roots in peaty bogs. But,unlike the single headed Eriophorum chamissonis, which I’d photographed earlier, this plant has 2 to 8 fluffy spikelets on each stem, drooping in a cluster. This Deer Cabbage flower, Fauria crista-galli, had several small visitors! they are really very tiny! My favourite muskeg plants were the Sundews; insectivorous plants that thrive here in the bogs where nutrients are low. These are Drosera rotundifolia, which are very small plants and you really do have to get down to see them clearly. But to see them was well worth the long, hot hike up that hill. A close up of the stunningly beautiful Round-leaved Sundew; Drosera rotundifolia. The leaves are covered with sticky gland-tipped hairs that capture and digest insects. How amazing is the evolution of plant species! I always delight in finding plants like these. And this is another species of Sundew found in a nearby bog pool. This one is the Great Sundew; Drosera anglica. A close up of a Great Sundew; Drosera anglica. Different shaped leaves but the same mechanism for catching insects. Another very low-growing plant is Linnaea borealis or Twin Flower. I enjoyed seeing this delightful pink flowering plant which David had seen on an earlier walk. It seemed quite at home growing amongst the sphagnum moss on the muskeg. Various types of sphagnum are the most common plants on the muskeg. they help to provide some nutrients for plants such as the Twin Flower. This is one flower we found that we haven’t been able to identify. Although David does know many plant names, when he is out of area in places like this bog in Alaska, many of the plants are new to him. We’ve had to search our books and the internet to name many of the plants in this Alaskan diary. We find that Images on Google is a great place to go to help in verification after a first effort at naming. Sometimes, however, we come up with a blank. If anyone can help with the correct naming of this flower, please leave a comment at the end of the post. 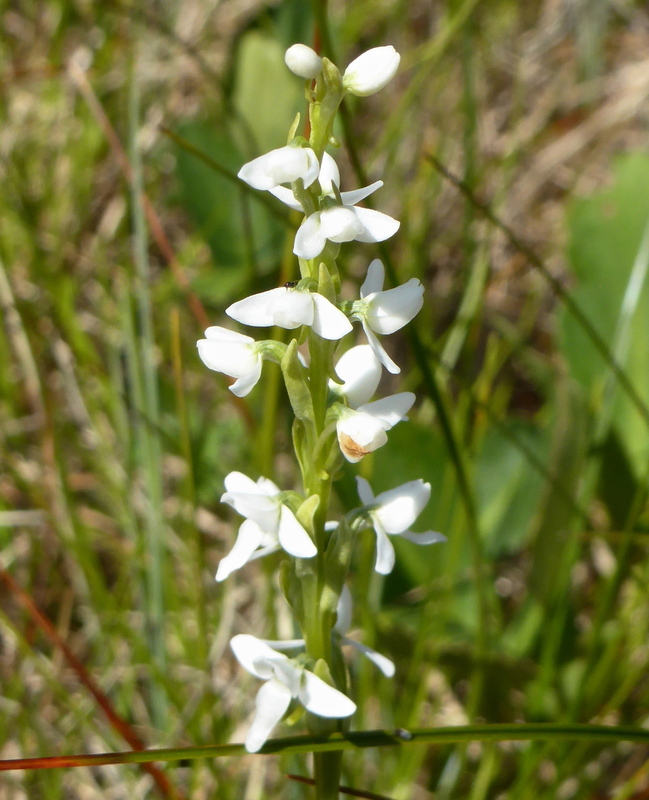 The lovely White Bog-Orchid, Platanthera dilitata, was much easier to identify. The waxy flowers of this orchid might be small but they are very fragrant, smelling, some say, of a mixture of cloves, vanilla and mock orange. The plant is poisonous and extracts from it were used by some indigenous groups to act as bait for bears. Pretty but poisonous! I was enjoying the sculptural shapes of stunted trees. And this one had a small visitor. A dragonfly; it seemed to take little notice of me or of my camera. I was able to observe it closely and was delighted by those delicate, gauzy wings. Sometimes it pays to be on your own… take time … and be still..
Just as we left the plateau to make our way back down the hill, I noticed this patch of Twin flowers, Linnaea borealis. The small piece of wood beside them gives some idea of relative scale. They are tiny; but so beautiful. Back in the edges of the old growth forest, David found this perennial trailing plant that likes to grow on moss, Rubus pedatus, or Five-leaved Bramble. The leaves, as the name suggests, are divided into five toothed leaflets. They give the plant its species name, pedatus, or foot. The fruit forms a small juicy flavourful cluster, like a raspberry. More interesting leaf shapes caught David’s eye. A quick photo and after that there was no chance to photograph anything. The rest of the group seemed anxious to return to Petersburg and have time to explore there. So it was a very quick and anything but an easy descent on those unevenly spaced and sized steps of the boardwalk. With my brand new bifocals, I was having a bit of trouble gauging the distances down the steps and there were no hand rails! I was grateful to my companions, teenagers Alex and Rachael, who told me not to hurry and promised help if I should falter! I was quite relieved to reach the level path in the lower forest that lead us back to the shore. While we’d been out walking, the tide had come in quite a way. At least the ramp down to the pontoon would not be nearly so steep, but still steep enough. While waiting for our DIB, David took one last view of Petersburg and the mountains beyond. No wonder they call it ‘little Norway”! If you enjoyed this, please pass on the site to others.